Geared towards meat-loving home cooks looking for expert advice and inspiration, here are 100 delicious recipes for using the most popular cuts of meat, plus loads of practice tips from America's favorite butchers. This friendly and accessible cookbook offers over 100 recipes for delicious meals using a wide range of popular beef, pork, lamb, and veal cuts and aims to help the home cook get the most out of meat for dinner. Each chapter begins with quick-cooking cuts and easy methods, like stir-frying, and progresses from there, offering recipes for grilling and pan-frying, and ending with recipes for more time-consuming cooking methods, such as roasting and braising. The recipes use a range of meat cuts that are easy to find at the butcher counter, and the flavors of the dishes, though varied and modern, are crowd-pleasing and familiar. The text is informative and comprehensive, but not too daunting or technical. 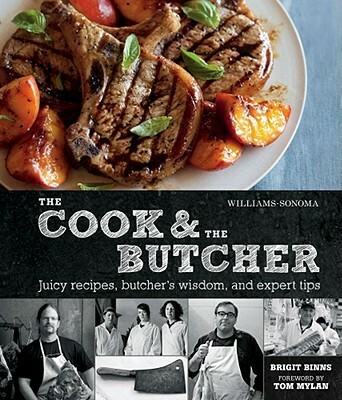 Most of the recipes are accompanied by useful tips written by more than twenty butchers from across America. In this innovative look at a favorite subject, author Brigit Binns draws on tips and tricks learned from renowned butchers and expert steak-house chefs to show you the best­—and most delicious—ways to cook beef, pork, lamb, and veal at home. Meat is the star in this collection of over 100 modern recipes, which use fresh, seasonal ingredients and a wide range of cooking methods—stir-frying, sautéing, panfrying, grilling, roasting, braising, smoking—to create irresistible dishes. Binns introduces us to such flavor-boosting cooking practices as residual-heat roasting, which slowly cooks large cuts to perfection in the lingering heat of a turned-off oven; double-searing steaks and chops on both ends of a long resting period to develop a tempting crust and melt-in-your-mouth texture; and seasoning meat before and during cooking. She also demystifies both the everyday and the novel techniques you’ve always wondered about, like how to make jerky; how to grind meat at home for sausages and burgers; how to butterfly, stuff, and tie meat; and how to pound, bread, and cook various cuts for the best results. In a FAQ column that opens each chapter, “rock-star butcher” Tom Mylan, owner of The Meat Hook in Brooklyn, New York, answers many of the most common questions asked by his customers. Plus, more than twenty butchers from across the country chime in with both practical and offbeat “Notes from the Butcher” for the many of the recipes, offering everything from savvy shortcuts and suggestions for alternative cuts to tips on how to talk to your local butcher. Among the other practical tools you’ll find are chalk-drawn meat charts that illustrate where specific cuts are found on each animal and easy-to-reference guides to doneness temperatures and cues. Packed with flavor, personality, and inspiring full-color photographs, this book promises to turn any home cook and meat aficionado into a seasoned professional.